﻿ dark field microscopy and bright field microscopy difference | dark field microscope,dark field microscope manufacturer. dark field bright field microscopy? These are different microscopic techniques. If one have the diffraction field of a perfect (or homogeneous) medium, he can see the image of a perturbation, making the perfect field lower or higer. If the homogeneous field is lower but the perturbation image intensity is higer, we have dark field image. When the homogeneous field has hihger intensity and we see the image of pertutbation as local decreasing of the intensity, we have bright field image. To learn about how dark field microscopy differs from bright field microscopy and to see some images of mosquitoes taken in dark field mode, read on. Bright field (transmission mode) microscopy is an older and very powerful form of microscopy. It is the most common, and is the only type available on most non-research-grade microscopes. In bright field, a light below the sample illuminates the specimen as the microscopist looks down from above, and the light from the light source is transmitted either through the specimen or directly into the objective. The light that hits the specimen is selectively passed through and/or refracted, so it looks colored. (If the specimen is opaque, no light passes through and the specimen just looks black.) In bright field the background (the field) is bright white because the source light is bright white and it hasn’t passed through anything to change its color. Bright field microscopy works best for samples which are thin enough to be transparent or translucent. For instance, stained cells show up very well. Click to see a bright field microscopy gallery. In dark field microscopy the specimen is not illuminated at all by light shining through it to the objective. 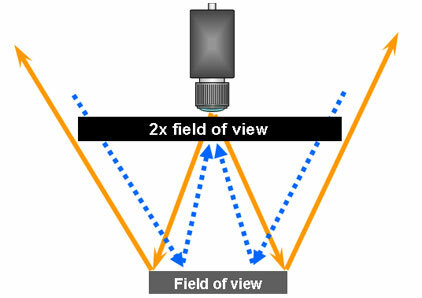 Bright field microscopy uses a condenser lens between the light source and specimen stage to focus light on the sample, but in dark field mode, a special condenser lens is used (or an opaque light-blocker is put in place above a normal condenser lens) that blocks all the light that would normally radiate directly from the light source into the objective. The lens scatters light from the source and lets oblique light through, and that light hits the specimen from different angles and scatters and refracts and reflects onto new paths that can reach the objective lens. Thus, in a dark field image, the background (field) is dark, because there’s nothing in the background for oblique light to reflect off of in order to get to the objective. Only the specimen is illuminated. In dark field images, the specimen usually appears in false color. The edges of features are usually visible in high contrast and resolution. Bright field and dark field microscopy are complementary: many specimens that are not well imaged in bright field are well imaged in dark field and vice versa. Dark field illuminated picture with labeled Microscope. Where is Bright Field Illumination used? Difference between Dark and Bright Field Illumination.